A healthy diet is important, especially if you're pregnant or planning a pregnancy. Eating the proper nutrients during pregnancy will help your baby to develop and grow. Yams are a safe addition to your diet -- high in potassium and fiber, low in fat and sodium and rich in antioxidants containing important nutrients. Comprising of over 150 species, yams are the tubers of the thick, tropical vine found in South and Central America, the West Indies, Asia and Africa, but not commonly grown in the United States. Yams are often incorrectly identified as sweet potatoes but they are not related botanically. Similar in size and shape to sweet potatoes, yams contain more natural sugar but are not as rich in vitamins A and C. Yams can grow to over 7 feet long and weigh 120 lbs. with flesh ranging from shades of off-white, yellow, pink and purple. Yams are an especially rich source of the antioxidant vitamin A -- 166 IU per cup -- which is important for bone and cell growth particularly during periods when cells multiply and develop, such as during pregnancy. A deficiency of vitamin A may increase mother-to-child transmission of HIV-1, according to the “American Journal of Clinical Nutrition” in May 2000. The safety and association of birth defects with excessive dosages of vitamin A from beta carotene in supplements has not been established, so Linus Pauling Institute recommends pregnant women obtain this essential nutrient from food, such as yams. The recommended daily allowance for pregnant females ages 14 to 18 years is 2,500 IU; those ages 19 years and older require 2,567 IU. It is important for pregnant women to eat foods rich in folic acid to help prevent birth defects of the brain and spinal cord and protect themselves against cancer and stroke. Yams contribute 22 mcg of folate per cup toward the RDA of 600 mcg. 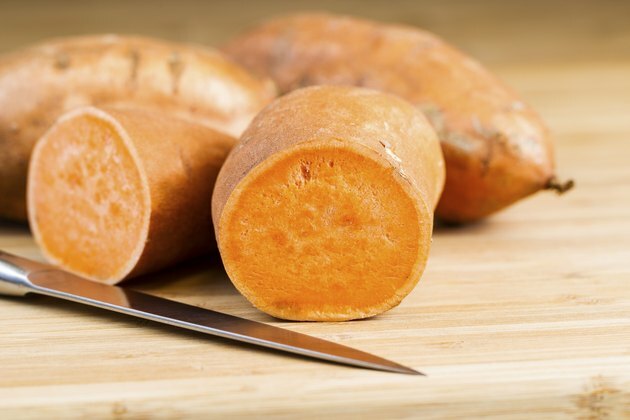 Iron in yams helps muscles develop in both mother and baby and helps to prevent anemia. Iron may also reduce the risk of premature birth and low birth weight. A cup of yams, providing 19 mg of calcium, helps the nervous, muscular and circulatory systems stay healthy. Without sufficient calcium in the diet, a pregnant woman’s body uses calcium from her bones to give to her growing baby. Wild yams have been traditionally used as a treatment for various medical conditions, including pregnancy-related nausea. Mexican wild yam is a primary source of synthesized progesterone, androgens and cortisone due to an ingredient called diosgenin. Diosgenin is an active steroid component that produces effects similar to estrogen. Because of the potential risk of affecting hormone levels and uterine contractions, pregnant women should avoid taking herbal supplements containing wild yam.